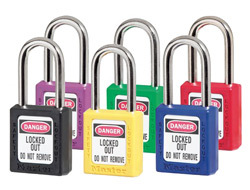 These types of padlocks are designed to prevent accidental use of machinery or electrical junctions. A single piece of equipment can be secured by multiple padlocks on a single colour coded lock-off hasp which prevents it from being operated or worked on without all key holders present. 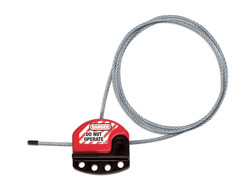 We recommend the brass shackle safety locks for electrical and petroleum applications to eliminate the chance of sparks.For lockout accessories and hasps, please scroll down. 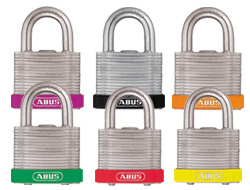 ABUS now extend their expertise into the Safety Padlocks market with this exceptional lockout padlock. Arguably the best and most reliable in the market, they are 100% non-conductive and available in 10 different colours. 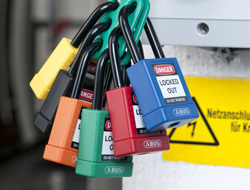 A purpose built padlock for safety lockout applications marked specifically with "Danger - Locked Out - Do Not Remove". Available in 6 different colours both keyed alike and different. These are a brand new development in the padlock market. 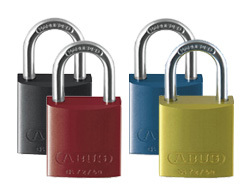 A secure and lightweight keyed alike padlock in various colours make this very desirable for the electrical industry. Please note this model is only available in a keyed-alike option. Here we have a number of accessories that can be used in conjunction with the safety padlocks to lock-out switches, plugs, circuits and valves. 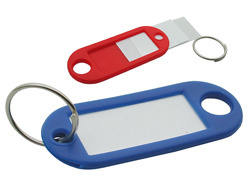 A selection of key tags with paper inserts available in various different colours. 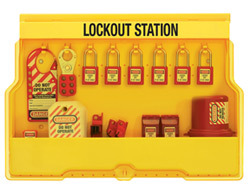 A lockout station to hold a number of different lockout padlocks and accessories, made from durable and heat resistant Xenoy Plastic Alloy. Includes a cover that can be secured with a padlock. 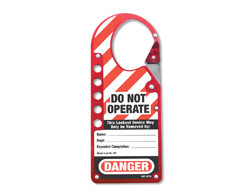 An anodized aluminium hasp for allowing multiple person lockout with ther added benefit of a large warning label and identification noitce. Each hasp is capable of taking 5 padlocks. 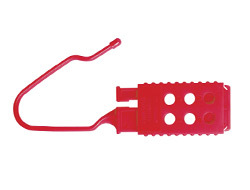 A non conductive hasp for sensitive electrical applications made from thermoplastic nylon. 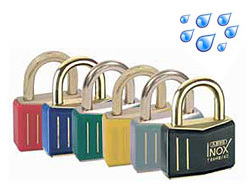 It can accept up to 6 padlocks and is 100% anti spark for use in petroleum applications also. Safety plugouts can be fitted around any electrical plug to prevent someone from using it. Made from heat resistant materials and available in two sizes. 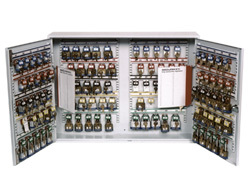 A cable lockout system adjustable from 0.2m-1.8m in length. 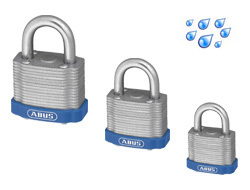 Each one contains an integrated hasp allowing up to four padlocks to be added. 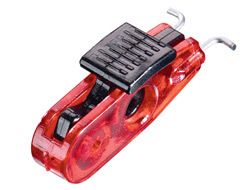 These small units can be used on standard UK and European circuit breakers to lock them into the on or off position. A padlock or number of locks can then be added to secure the swtich. 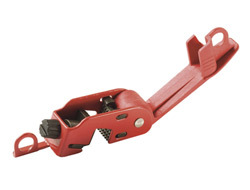 Switch grips can be used in various applications but primarily to lock-out circuit breakers. The unit fits over the top of the switch, tightened, then secured with a suitable padlock. 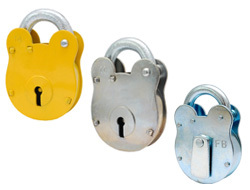 Often our customers require highly secure cabinets to store their safety lockout padlocks and prevent potential unauthorised tampering or copying of keys. Constructed from 1.5mm pressed steel and an anti-pick lock including a removable system sheet to store key specific information. We have 3 sizes of key cabinet available from stock and many more on demand, holding from 24 - 600 keys. 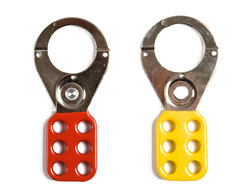 Specially design to hold padlocks and keys to isolate switch gear or machinery. 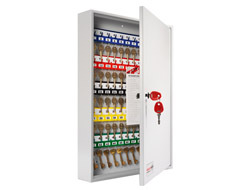 This cabinet is available in three sizes, providing space for 24 - 100 keys and their associated padlocks. Each cabinet is secured using a special high security cam-lock.